EcoLast Infinity-length runners are great for commercial applications where you want to stretch longer than you can with single-piece or two-piece mats. There is literally no limit to how long these mats can get. EcoLast Business Line anti-fatigue mats make standing more comfortable by reducing back, neck, leg and foot fatigue associated with long-term standing. Made in the USA from 100% polyurethane, this mat provides comfortable, consistent support without compromising durability. With a slip-resistant top surface and a non-skid bottom, the EcoLast mat is reliable and safe. The precisely laser-cut puzzle edges do not require any adhesives to stay perfectly flat, although you can super glue them together if you want to. The contoured edge design with 20° ADA-compliant bevel prevents tripping and allows for easy rolling on and off with office chairs. EcoLast mats come with a lifetime warranty and will never delaminate, bubble or curl at the edges. The long runner mats come in 2-foot and 3-foot widths and infinite lengths (if you need larger widths see our Custom Area Puzzle Mats). The left and right end pieces are each 4.75’ long. Add as many 4.5’-long center pieces to reach the total length you require. The minimum length is 9.5’ (just a left end and right end piece with no center pieces) and there is no maximum length. We’ve made them hundreds of feet long for warehousing and fulfillment centers! EcoLast is the trusted brand you’ll find in hospitals, fire stations, pharmacies, manufacturing and welding lines, food markets, and even Amazon® warehouse and fulfillment centers. 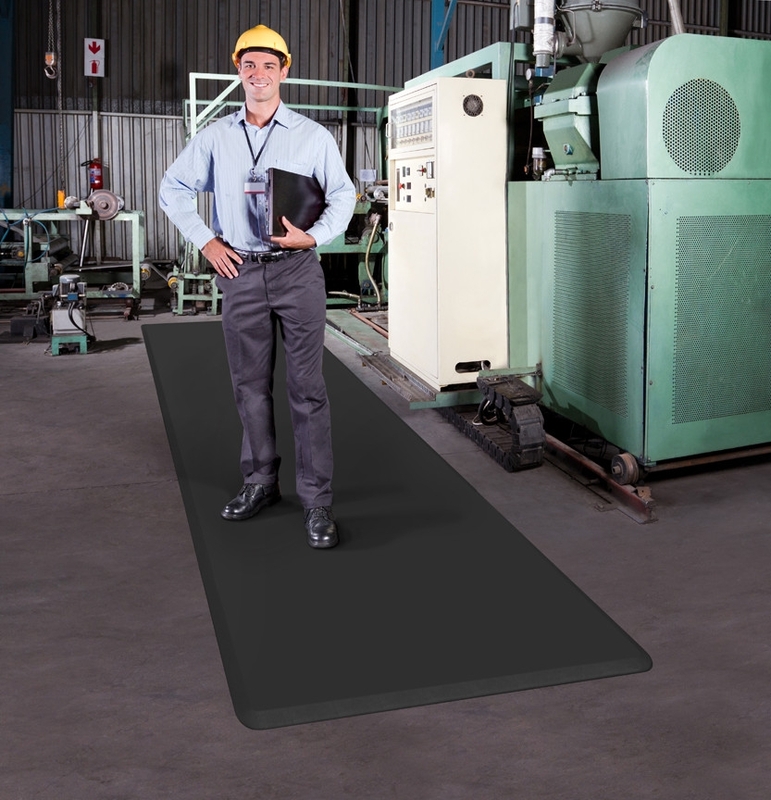 No other mat is as comfortable, durable and configurable for workers who spend many hours on their feet. Boost their happiness and productivity, and lower health care costs and abesteeism by installing EcoLast large-format mats in your facility. Left & Right Segments (ea.) 4.75' 2 11 lbs. 10" x 10" x 25" 12 lbs. 4.75' 3 16 lbs 10" x 10" x 37" 17 lbs. Center Segments (ea.) 4.5' 2 11 lbs. 10" x 10" x 25" 12 lbs. 4.5' 3 16 lbs 10" x 10" x 37" 17 lbs. All standing mat runners are 3/4" thick. 2' x 9.5' 22 lbs. 24 lbs. 2' x 14' 33 lbs. 36 lbs. 2' x 18.5' 44 lbs. 48 lbs. 2' x 23' 55 lbs. 60 lbs. 2' x 27.5' 66 lbs. 72 lbs. 2' x 32' 77 lbs. 84 lbs. 2' x 36.5' 88 lbs. 96 lbs. 2' x 41' 99 lbs. 108 lbs. 2' x 45.5' 110 lbs. 120 lbs. 3' x 9.5' 32 lbs. 34 lbs. 3' x 14' 48 lbs. 51 lbs. 3' x 18.5' 64 lbs. 68 lbs. 3' x 23' 80 lbs. 85 lbs. 3' x 27.5' 96 lbs. 102 lbs. 3' x 32' 112 lbs. 119 lbs. 3' x 36.5' 128 lbs. 136 lbs. 3' x 41' 144 lbs. 153 lbs. 3' x 45.5' 160 lbs. 170 lbs.